As a family dental practice, we understand the need for coordination of family finances. Expected and unexpected dental care costs can sometimes be a burden. We have always offered a variety of payment options to ensure that recommended treatment fits within the family budget. We accept most insurance plans and are happy to do a complimentary benefits analysis. Don't have dental insurance? Call us today at (651) 426-8998 and ask about our Membership Plan for our non-insurance patients. Now also in network with HealthPartners! A program designed to provide access to affordable quality dental care for our patients without dental insurance. And more ............PLEASE CALL FOR DETAILS! 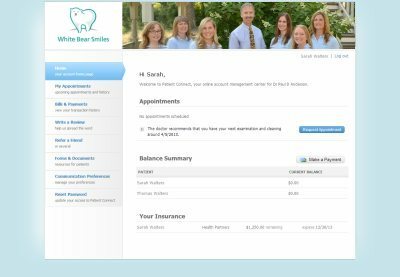 We want you to be able to experience the White Bear Smiles Difference, and see if we are a good fit for you. Then together, we can go over your particular situation and develop a treatment plan that's right for you - because everyone's needs and schedule and budget are different. Bottom line, you are in full control, and our main concern is your comfort. We want you to Smile a lot, and to Chew well! And that means different things to people and we respect that. When the need for dental treatment arises, please remember that we offer many options to ensure that you receive the best possible treatment for your dental health needs. We grow by the good words of our great patients and are always honored by the referrals of friends, family and coworkers! And to show our appreciation, let us enter you in our quarterly Refer-A-Friend prize drawing! For every friend, family member, co-worker, or neighbor you refer to our office, you and the person you refer will receive 3 entries. In addition to being entered into the drawing, you will also receive $25 "Smile Dollars" as a thank you from our office, redeemable for goods/services at White Bear Smiles. For each entry, your name will be entered into a quarterly drawing for some great prizes (4 drawings/year). THE BEST PART - THERE'S NO LIMIT ON HOW MANY ENTRIES YOU CAN RECEIVE!! and even pay your bill online! To access your personalized Patient Connect dashboard, click here to login or register. If this is your first time accessing the dashboard, you will need to register by providing your email address - further instructions will be sent via email. If you are unable to register, it is likely that our office does not yet have your email address on file (in which case we'll need to add it). Please give us a call during business hours at (651) 426-8998 if you run into any issues, and we'll be glad to help. We are always pleased with our patients' insights and suggestions. So please offer any recommendations or concerns to help us improve the practice. It's your practice, too! We grow by the good words of our great patients and are always honored by the referrals of friends, family, and coworkers!